Gandhi believed disobedience is duty when something is repugnant to our conscience. No matter the law. Dissent in the air. With the arrest of activists, academics and conditional locks on the freedom of speech, India is struggling to define dissent. This was precisely the dilemma that confronted Mahatma Gandhi as well. Is it a right guaranteed to us by India’s Constitution? But what if we disagree with the legal structure altogether? We see dissent as an act of democracy that allows us to challenge the all-pervasive power of the state and of the law. Dissent now even signals hope in judicial proceedings in court. But, is dissent part of the constitutional structure? If we accept the idea that dissent accrues to us as citizens from some notion of constitutional morality, we are bound by the power of the courts to determine the validity and legality of our actions. And we have a judicial tradition of making a fetish out of dissenting opinions of judges. But, what if we have a fundamental disagreement with the structure of law and the judicial power of review of such laws? Do Indians have a space for dissent, a disagreement so basic that we would consider even approaching the courts to determine the validity of a legislation to be a violation of our duty? Gandhi faced this question. And not only Gandhi but everyone who lived under the structure of the British empire and any other regime where the very nature of the state and its court apparatus was illegitimate. This question confronts all those who live in non-democratic regimes across the world. If the Constitution is not of our making, then it is not a pledge that we have taken as a people. It is not a document ‘we give unto ourselves’, the idea of dissent needs a source other than constitutional morality. Gandhi’s answer to this was — conscience is the source of dissent. When something is repugnant to our conscience, we refuse to obey it. This disobedience is constituted by duty, and by doing so we become Satyagrahis. Disobedience as duty requires us to know ourselves, it requires us to recognise the supremacy of conscience, cultivate the art of listening to it (no matter how small that voice) and submit to its dictates. This state is described by the Gita as “when it is night for all other beings, the disciplined soul is awake”. According to Gandhi, one can hear this voice when the “ego is reduced to zero”. Reducing the ego to zero for Gandhi meant an act of total surrender to Satya Narayan. This surrender requires the subjugation of human will, of individual autonomy. It is when a person losses autonomy that conscience emerges. Conscience is an act of obedience, not wilfulness. Gandhi said: “Wilfulness is not conscience…Conscience is the ripe fruit of strictest discipline…Conscience can reside only in a delicately tuned breast”. Gandhi knew what a person with conscience could be like. “A conscientious man hesitates to assert himself, he is always humble, never boisterous, always compromising, always ready to listen, ever willing, even anxious to admit mistakes.” A person without this tender breast delicately tuned to the working of the conscience cannot hear the inner voice or may end up dangerously listening to their ego. 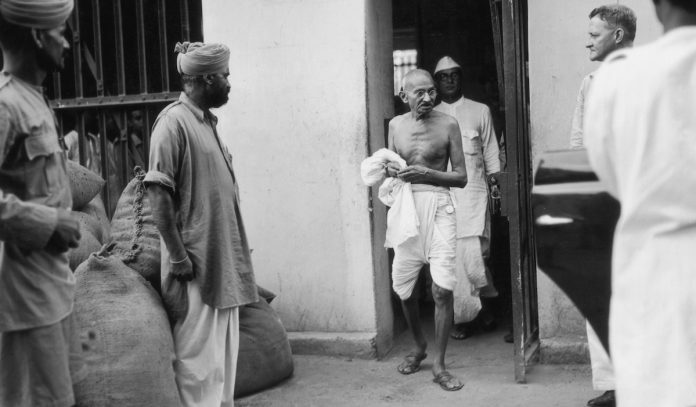 In Gandhi’s understanding, disobedience in the ultimate sense is not an act of autonomous will but of the will being surrendered to the conscience. This surrender gives one the capacity to question and disobey the basic structure of ideas, practices and tenets. Disobedience or dissent thus viewed renders dissent as a category and practice that is deeply personal. Its politics originates from its character as ‘Dharmya’. It demands obligatory obedience to a principle that is higher than self, politics, authority— scriptural and temporal. This kind of dissent is something that is not capable of being taught by others. Dharmya disobedience is a practice. Despite its public nature, it remains within a deeply held and conserved private domain. As something that has origins in the conscience it can be beyond reason and hence dialogue in the ultimate instance. A non-dialogic and yet duty-bound and righteous act has the potential to command authority and tendency to be authoritarian. We have here a dilemma. If conscience is the sole arbitrator of dissent we have to recognise its non-dialogic and authoritarian potential. It is potentially anarchic. And yet in every situation of slavery, of oppression, conscientious dissent is the only human right available to us. It is the only practice that allows us to fulfil the human vocation to strive towards freedom. Gandhi followed it. The author has recently published a Critical Edition of M.K. Gandhi’s Autobiography.